I am very honoured to be here with Drs. M. Habib Chirzin, president of the Islamic Forum for Peace, Human Rights and Development Millennium. 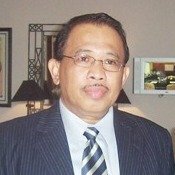 Mr Habib Chirzin is a world citizen and is highly respected in Indonesia and far beyond the Indonesian borders. I would like to take you to a period during World War II in Indonesia, at that time known as the Dutch East-Indies. I was 14, the age my grandson Diederick is now, when my whole family, including grandparents, and I disappeared behind the barbed wire fence of a Japanese concentration camp. It was one of the many concentration camps in the archipelago. That’s where I learned about hunger; that’s where my soul despaired in black nights. Still – and that is what I would like to pass on to my grandkids – in that camp I learned to discover the stars in those black nights and I have always tried to apply that during the rest of my life. When we were liberated from the camps, we expected to be able to pick up our previous kind of life again. Far from it: you are all aware of the history. We got involved in a colonial war with the Indonesians. Forced by the international community, the Netherlands in the end had to return to the negotiation table. Several negotiation sessions were held, but the most decisive one was the ‘Linggadjati Conference’. The house where the Linggadjati negotiations took place happened to be my parent’s house, built by my father Koos van Os. The home where my two siblings and I spent a magnificent youth. The Indonesian Government in 1970 has designated this house, surrounded by lush gardens and at the foot of the 3000 meters high volcano Mount Ceremai, as a museum – a symbol of their national war heritage. This museum is cherished and maintained under the auspices of the local government – the Bupati – and the national authorities in Jakarta. In this context, it is noteworthy that the initiative by the Indonesian authorities of guarding and maintaining this war heritage object is remarkable. It is quite surprising that Indonesia maintains and cherishes a monument that until recent was not even part of Dutch colonial history, nor considered as part of the Dutch Colonial Heritage. Would it not be a manifestation of remarkable vision if a war heritage object is cherished and maintained by both countries? What happened at Linggarjati? In November of 1946, negotiations between the Dutch delegation led by Professor Dr. Schermerhorn, a solid Protestant, and the Indonesian delegation led by Sutan Sjahrir, the Premier of the recently proclaimed Republic of Indonesia and a devout Muslim, resulted in the ‘Linggadjati Agreement’. Thus, Linggarjati became the definite beginning of the formal process of decolonization. Prof. Schermerhorn and Sutan Sjahrir were ahead of times. They were world citizens. They were democrats, because they were convinced that a nation should be in the hands of many and not individuals; that laws should give the same rights to all and that honour should be accorded to anybody that distinguished themselves in public life. Not because of class, nor religion, nor race but because of the individual’s worthiness as human being. They were advocates of tolerance in personal interaction and adherence to the law in public life, in particular those laws that protect the oppressed and the unwritten laws that if broken, bring shame in the eyes of the public. As true world citizens, Schermerhorn and Sjahrir realized that a definite blueprint of democracy does not exist. Democracy in the Republic of Korea for instance, is not the same as the one in Norway; the one in the United Kingdom differs from the one in the Netherlands and the United States has a form of democracy that is different from the one in the Philippines. Everyone seeks the best form. Sutan Sjahrir was a man that has a place among the great freedom fighters in the world such as Gandhi from India, Senghor of Senegal, Mandela of South-Africa. These leaders all represent the highest level of anti-colonial leadership. They succeeded in keeping nationalism free from foreign influence. Prof. Schermerhorn too, was a special person and statesman whom from the beginning worked towards full independence for Indonesia. During World War II he was held captive by the Germans and subsequently was a member of the resistance. Both these statesmen were champions of human rights. Liberty, they taught us, is not bound to space or borders. Liberty begins in the mind. You can be free even when you are locked up in a concentration camp, on the other hand you can live in freedom and still be a prisoner. World War II is far behind us, but the interest in the Netherlands as well as in Indonesia in our own history, is blossoming. In November last year, the commemoration of the Dutch-Indonesian negotiations at Linggarjati sixty years ago was celebrated. On this occasion, in the presence of the Dutch Ambassador and representatives from the foundation ‘Friends of Linggadjati’, the Minister of Foreign Affairs of Indonesia Dr. Hasan Wirayuda, held an inspiring speech. He reiterated that the Linggarjati Museum had a deep meaning for Indonesia and would like to revitalize the museum and invited the Netherlands to participate. The foundation ‘Friends of Linggadjati’ has taken the initiative in this matter and has discussed it in general terms with the Dutch authorities, which have shown a positive attitude. In this context, it is therefore with much pleasure that I can inform you that also from the side of ‘Het Gebaar’ our foundation has been granted a substantial amount of money that will help efforts from our side to make this museum a unique project. Indeed, Linggarjati is a symbol for the next generations as well, not only as the actual place where two nations met, but also as a place where global history – from a global historical perspective – offered new horizons and not just a look at history from a pure Dutch or pure Indonesian side only. A museum that now, sixty years after the war, can teach our children that East and West, Christians and Muslims, people from all cultures, races and believes can indeed communicate and learn from one another. Learn to tolerate one another. We ‘Indische’ people have a definite say in this. After the war, 300.000 of us, by choice or by force, had to repatriate to the Netherlands. You could say that we were the first ‘aliens’ in Holland. In those days things did not always go smoothly either. I remember an aunt of mine who hung fish to dry on the cloth lines and grilled satéh on charcoal in the living room, much to the irk of all the neighbours. Still, we too became respectable Dutchmen, didn’t we? Recently, a decision was made to create a Memorial in Arnhem, where all our memories shall find a lasting place. Also Linggarjati will be allocated its historical spot there. Tolerance does not mean not caring, libertinism or opportunism. Tolerance is the deep, deep conviction that every person has the right to their own opinion, indeed, their own religion, but such opinions or religions should not, under any circumstances, be forced on others.